Travelling from Bagshot/Lightwater on the A322 Guildford Road to Guildford continue along this road, passing Queens Road on the right. Continue until you see a sign indicating Knaphill and Woking. Just beyond this is a T Junction, turn left here into Limecroft Road which goes straight to Knaphill Street. 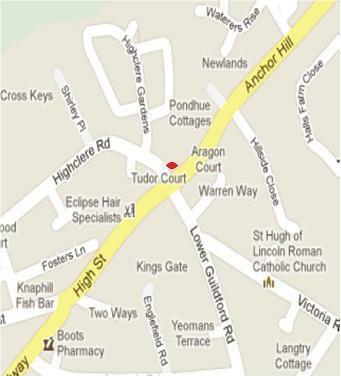 Continue on the High Street until you come to a set of traffic lights with the Anchor Pub on the right. Turn left at the lights and the practice is diagonally opposite. Travelling from Guildford on the A322 Bagshot Road go under the railway bridge at Brookwood and continue straight on, you will pass Strafford Lake Road on the left, just beyond this is a T Junction to the right, turn here into Limecroft Road and into Knaphill as above.